It’s always entertaining when analysts publish reports on Apple products because they are always so juicy. The latest from Jefferies’ Peter Misek contains numerous predictions based on supply chain notes and Taiwan sales data. He notes the rumoured September 12th Apple iPhone event will include “an announcement of the iPhone 5, possibly of the iPad Mini, and less likely of the iTV. Bloomberg notes the evidence used for Misek’s predictions are based on the the recent activity of Sharp and Hon Hai Precision. The latter had a 5% revenue increase in July over its previous month, at a time when sales typically remain even. Sharp makes TV screens and Hon Hai Precision assembles the iPad for Apple. Misek also noted other specialty chemical and TV component suppliers had more activity than usual. Over the past two days the WSJ has released two detailed reports that supposedly detail Apple’s ongoing negotiations with cable companies to partner up and use an Apple set-top box for live TV. I don’t think a full-fledge Apple Television is coming anytime soon. We would most likely expect to see leaks on such a device, plus as of now, the television industry looks to be on its deathbed as consumers aren’t buying them in hoards like they used to. But maybe that means there’s a void to fill should Apple want to swoop in with their interpretation of a TV, but then again the premiums on this would be hard to justify. 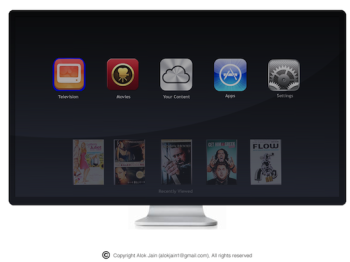 Thus, it’s more likely the current Apple TV turns into some sort of magical set-top box ‘iCloud’ DVR as rumoured. As for the next iPhone predictions by Misek? I think the next iPhone announcement date has been bludgeoned to death–if it doesn’t happen on September 12th there will most likely be riots with pitchforks in the streets.